Spring is officially here! I've been anticipating spring for awhile now so I couldn't be more excited to finally welcome it with big open arms. I love Spring! I love watching the trees turn green, the flowers start to bloom. I love listening to the birds chirp, and spending more time outdoors; feeling the fresh air and warm sunshine. How about you, are you happy for Springtime too? 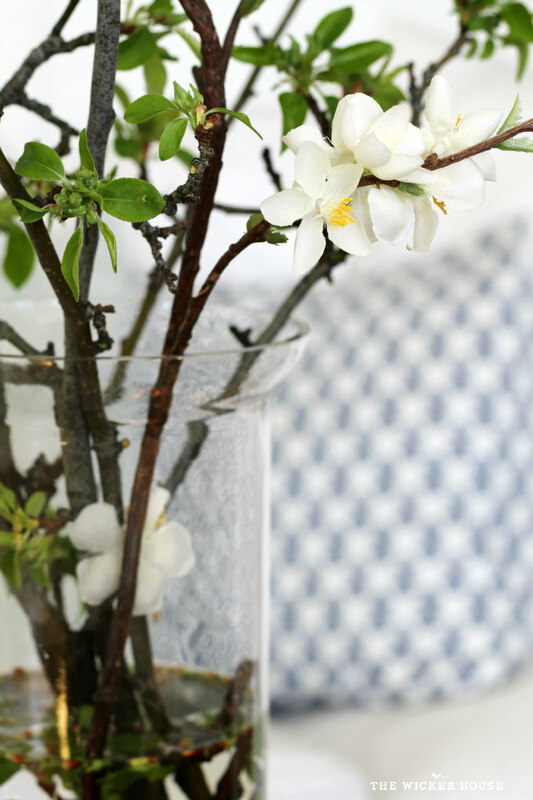 Today, I am joining 16 lovely blogging friends to share how each of us have freshened up our homes for Spring. We will each also be sharing a tip or two so that you can leave each tour feeling inspired. So be sure to check out all of the homes in the tour, because trust me, you do not want to miss any of them! All of the links can be found at the end of this post. 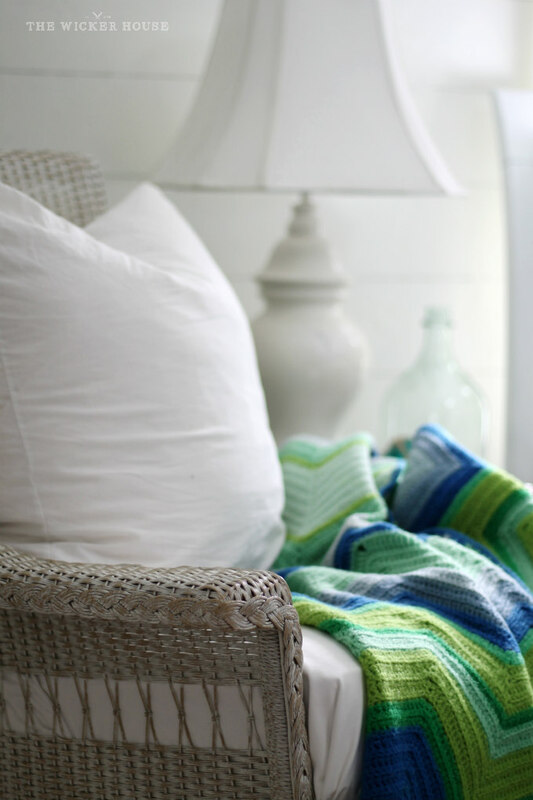 Thank you so much, Rachel from Shades of Blue Interiors for inviting me to share our home, which I have had so much fun adding bits of spring to. Our entryway is one of my favorite spaces to decorate, I think it's because it's right next to a big south facing window and so it gets a lot of great sunlight. 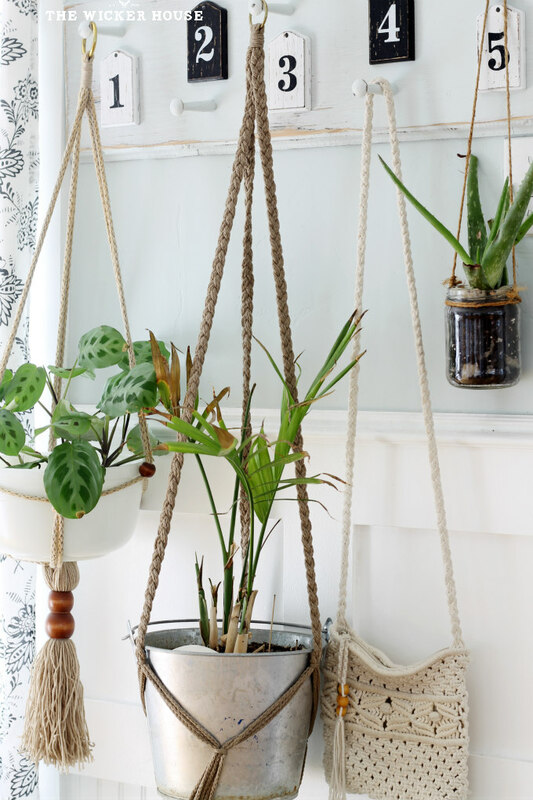 That would be the reason why I decided to hang a bunch of plants from my coat hooks, which is so much more prettier to look at then bulky winter coats. Adios coats! See ya later! Now every time I post pictures of our living room, I always get a ton of comments regarding the paint color, so I just want to jump in real quick and let you know that the color is called, Old Fashioned by True Value. 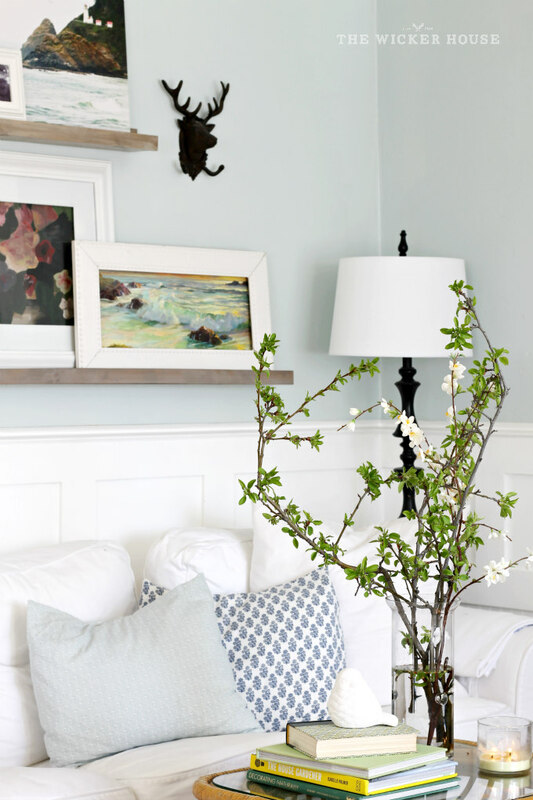 It's such a pretty soft blue that it makes a perfect backdrop for my Spring decorating. In our living room, I recently picked up this bamboo coffee table at a thrift store, and I can't get over how perfect it goes with the bamboo mirror from Target. Above the couch are my DIY Picture Ledges where I have displayed lots of pretty art. I layered my new coffee table with colorful books, a sweet little birdy, a lovely scented candle, and a few branches from my yard. I think the branches are what make the biggest statement in the room, and actually they are probably a little too out of hand. But once they start blooming with lots of little white flowers, it's going to look really beautiful. Because you can't rush nature, while I wait for my branches to get blossoms, I mixed in a couple of fake flowers to the bunch so it looks as though it has already started to bloom. To the left of the living room is the dining room. This wall here helps to divide the two spaces. 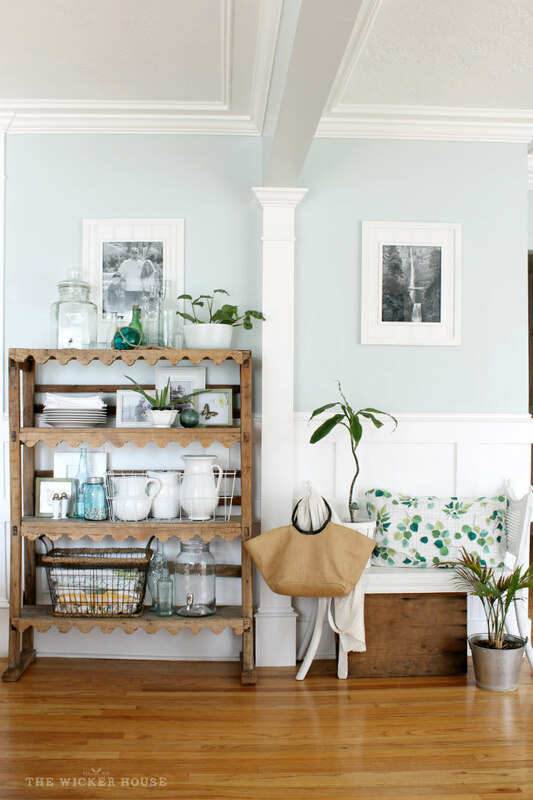 I gave this area a fresh new look and shared my step by step styling tips for pulling this look together in this post. 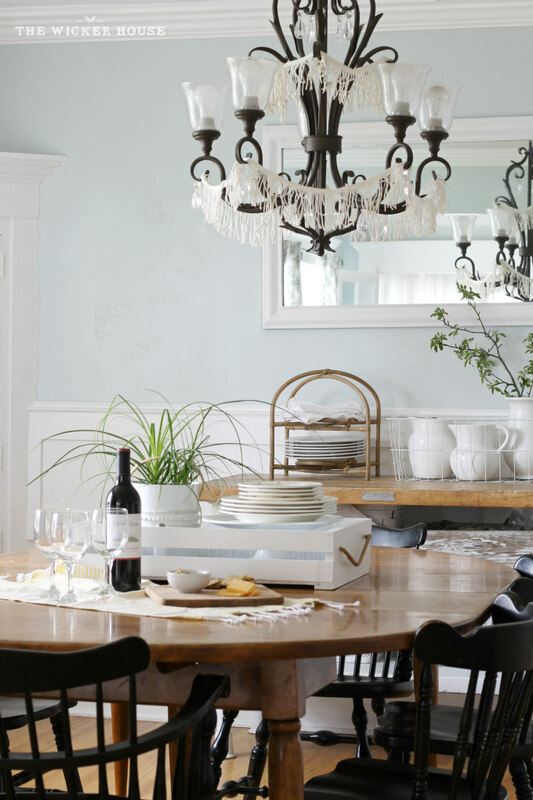 Here in the dining room, it's kinda quirky, but I hung some white fringe from the chandelier. I then kept the styling really sweet and simple. 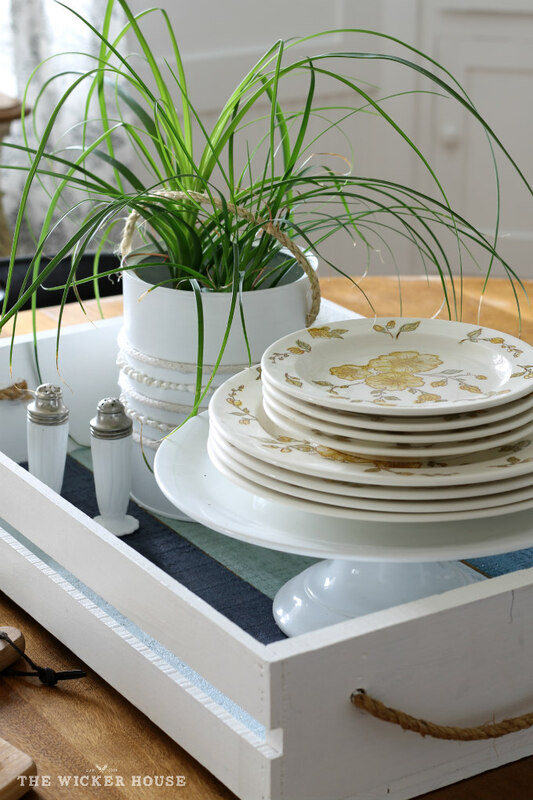 I placed This tray to the center of the table and styled it with a plant in my DIY coffee can turned planter bucket, and a stack of pretty vintage plates. I've also added a few touches of spring in my bedroom. Just in case you didn't know yet, My plank wall is Fake!! I drew my planks on with a pencil! You can learn more in this post. The bedding is from World Market, I've had it for years now, I like how it feels so spring to me. 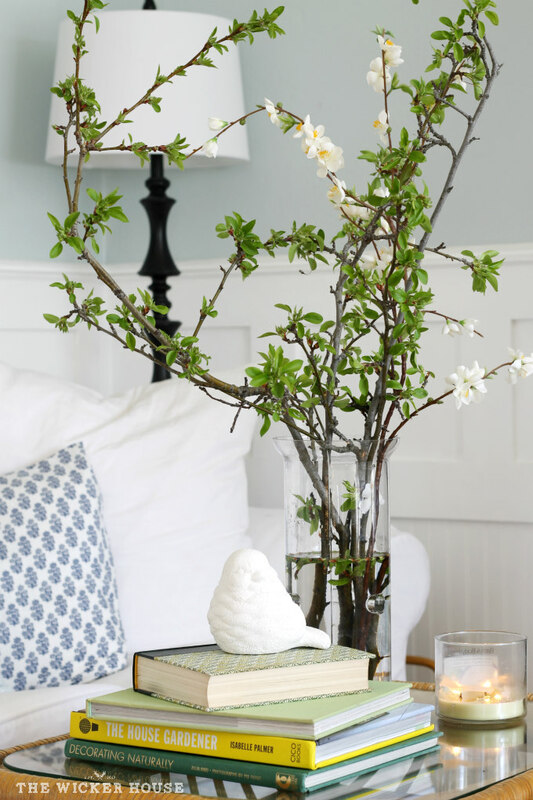 Don't hesitate to bring in yard decor, like this large butterfly above the bed. Garden art makes great spring home decor too! This wicker rocker is also meant for outdoors, but I brought it in as well. And lastly, I just wanted to share a picture of our kitchen that I recently made over. You may have seen it already, but if you are new here, you can see more of it in this post. Thank you so much for stopping by today! Be sure to check out all of the other lovely homes on the tour by clicking on the links below! 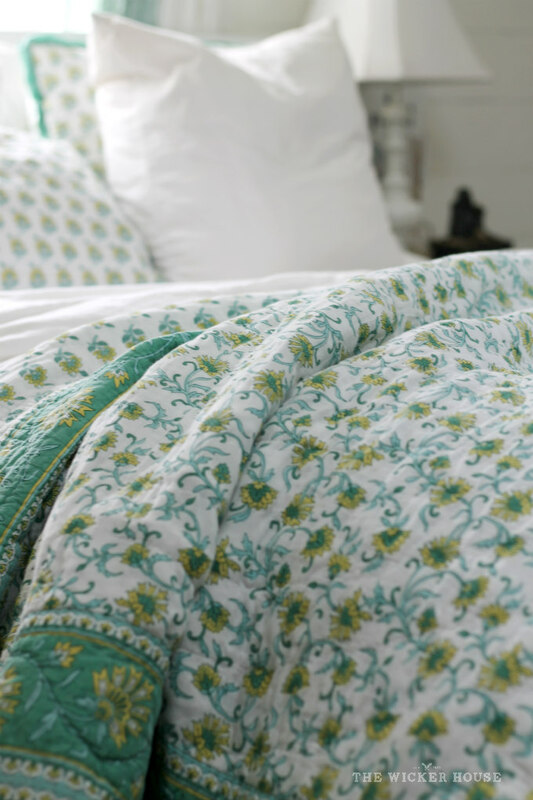 LOVE the bedding you added for Spring! your home is always a favorite of mine, emily- i could move right in! you don't mind, do you? I want to go on vacation in your home. So lovely! I just noticed you painted the area around your stove white! I love it, it looks great. You're house is ready for spring! I also spied the Ste. 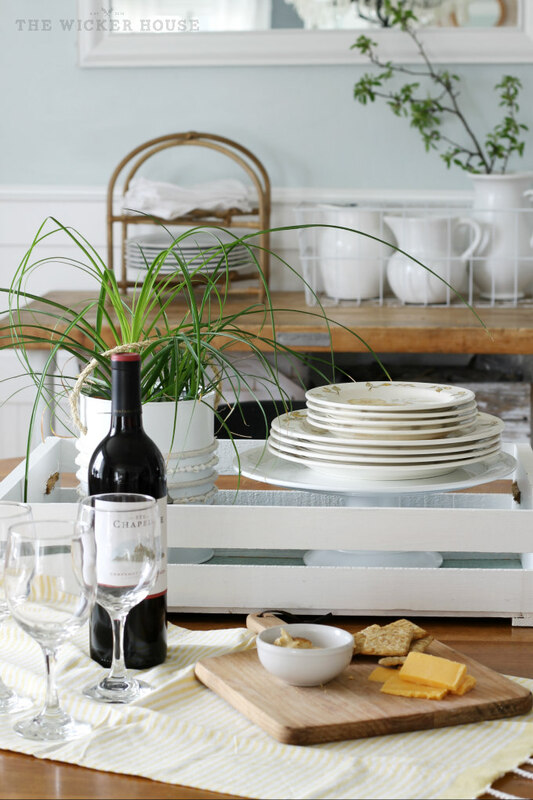 Chapelle on the table...love their wine. Oh Emily! I love love love your house! Pinning the heck out of this post! Wow Emily your home! Holy cow where do I start? 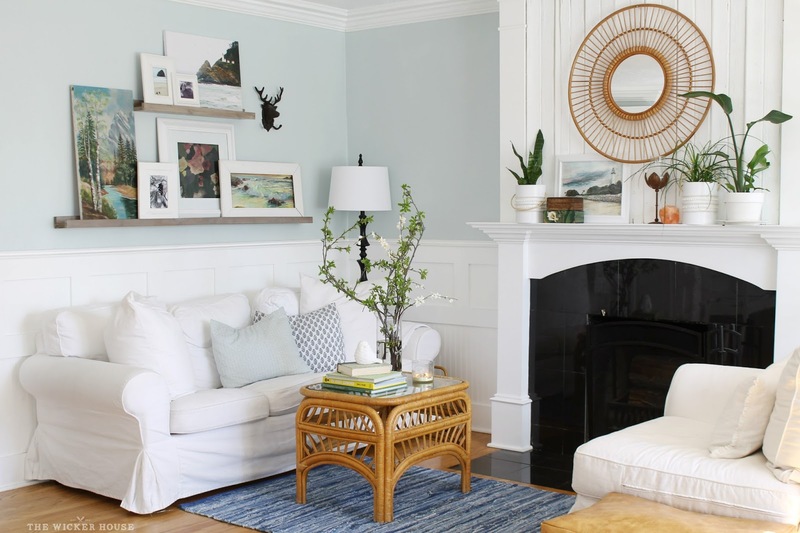 The shelves with the art above the sofa is so awesome, I'm sure I've seen it before but I noticed it more in that shot-- love all the art and I know it can be hard to find good ones with the right color and the right size so I'm jealous... and the wicker end table is perfect! Also your bed is hands-down my favorite. The butterfly is just brilliant... it all looks so cozy! 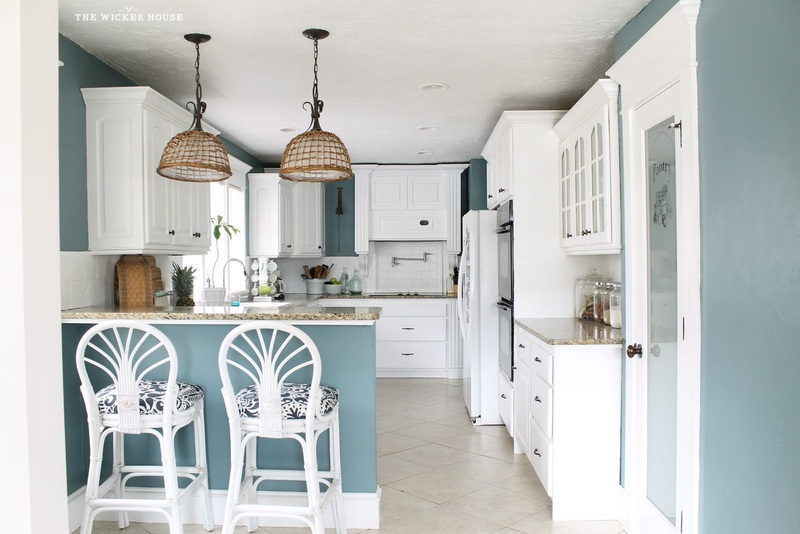 Your kitchen is killer too--- that blue!! LOVED your tour Emily! Those hanging plants are amazing - beautiful! Your home is so pretty, Emily! 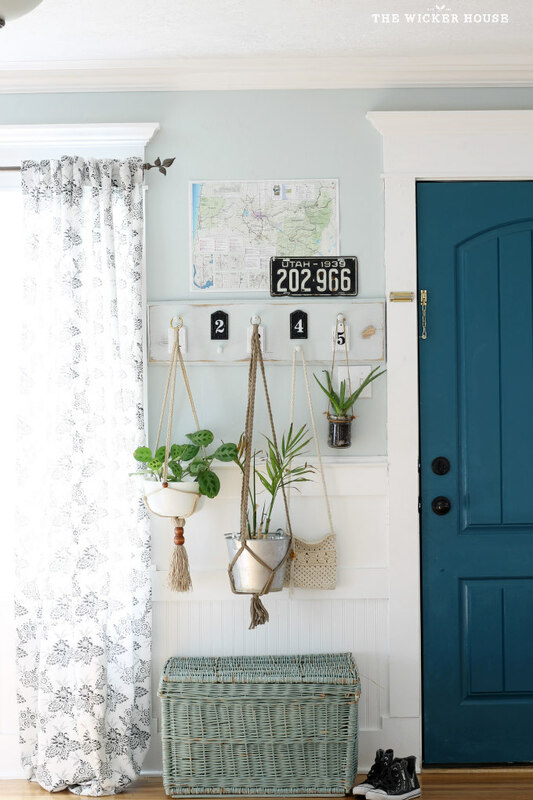 I love the plants hanging by the front door (genius idea!) and the butterfly over the bed! Where did you find it? Your bedding is really pretty too. Really makes the room feel spring-y! The bamboo table in the living room looks great, we have a similar looking one that my wife found at a thrift store out of town. It really adds to the room as a whole. 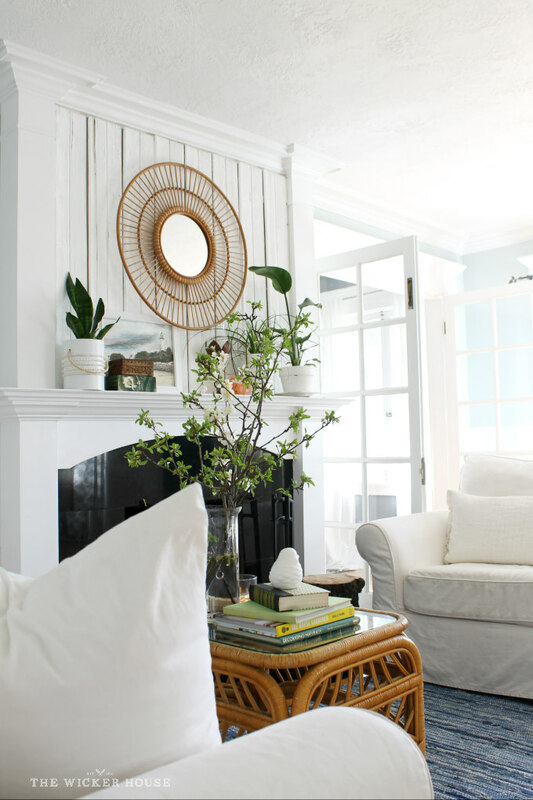 I love the white interior and the contrasts of blue and green. I am also a huge fan of house plants. شركة المنزل هى شركة نقل عفش بالطائف لدينا العمالة المدربة التى تقوم بخدمات نقل العفش ولدينا السيارات المجهزة والاوناش والروافع التى تقوم بنقل العفش فى اى مكان بالطائف وعمالتنا تقوم بتفكيك العفش واعادة تركيبه حتى لا يتعرض للخدش او الكسر كما اننا شركة تخزين اثاث بالطائف ولدينا المستودعات المجهزة لخدمات تخزين الاثاث والخالية من الحشرات والقوارض والمؤمنة من السرقات والحريق وجميع خدماتنا متوفرة بأرخص الاسعار .